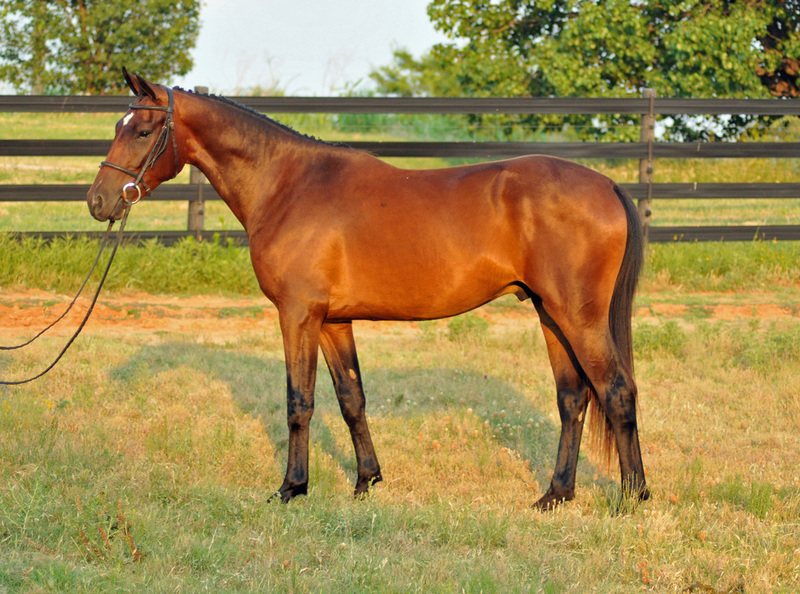 Aerosmith is a striking bay gelding by Argosy and out of Macy's Rainbow. He was awarded Premium foal and Foal of Distinction at his Oldenburg inspection. Dark bay with a star and a snip accentuates his typey, elegant good looks. Friendly and outgoing, he is in your pocket as soon as you step in the pasture with him. He has a quiet demeanor and is unflappable when introduced to new things. The photos of him free jumping were taken on his first and second time introduced to the chute. Aerosmith has been started and as of July, 2014, he is going quietly and calmly under saddle. He currently stands 16 hands at 3 and string tests at 16:1.5. With his breeding, type and athleticism, this boy should be able to jump anything that he is pointed at. Stay tuned for more current video of Aerosmith going under saddle! Sold! Congratulations to Carol Sutton on purchasing this stunning young prospect!